Cane Corso as a Guard Dog – Need or a Want? My question is, we are looking at getting a Cane Corso this weekend in a couple days. We have a choice of a male or female. My dilemma is, we have two dachshunds. My boy is 12.5 years old and our female is 6 years old. 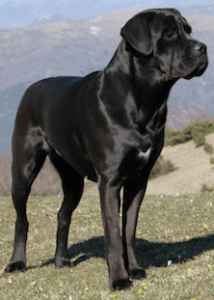 We want a Cane Corso to be our family guard dog and defence for my wife who isn’t very big. How will the female or male interact with the Dachshunds? With proper training can they be trusted to be alone with them? Would a female be better than a male with them? While being a “family guard dog and defense for my wife” is a common enough reason to get a Cane Corso, I can’t say it’s the best or even a very good reason for getting one and rarely in my experience does it pan out that there is an actual need. Maybe it’s different for you, on the basis of your email I can’t say but on the law of averages based on my considerable past experience with owners of Cane Corso and similar breeds I can say my response regarding very few people needing the guarding power of a Cane Corso ever do and in the end many regret it and the dog pays a heavy price. So I’m suggesting give this some careful thought. The man stopping power of a Cane Corso is not something to be trifled with. It’s not like buying a gun, it’s more like buying a gun – with a brain. A very big, very powerful gun – with a brain. As a result, the level of obedience the dog’s owner should expect from the dog is far greater than one might expect from a couple of Dachshunds and few companion dog owners have the desire and/or the time to achieve that level. 1. How many of the people walking by my property, on to my property or through my door in the last 12 months required the man stopping power of an engaged Cane Corso? You could also look at your track record with the Dachshunds to get a sense of what you might expect your obedience success might be with the much larger and potentially miffed at a friend that shows up at your door unexpectedly Cane Corso? 2. Will your Dachshunds, when asked to stay do so without the need for treats or your monitoring their every twitch long enough for you to make a cup of coffee? 3. Do your Dachshunds come when called around any distraction? 4. Do your Dachshunds keep the leash loose regardless of distractions? 5. Do I really need a family guard dog or do I need the presence of a dog to act as an alarm and as a deterrent? This is a completely free e-book. No email address required. Direct link. I have to wonder if 99 out of 100 Cane Corso owners that think they need a dog with the guarding/man stopping potential of a Cane Corso – actually have a need for that level of dog and can they demonstrate even basic control over their Cane Corso in a non-guarding context let alone when he or she goes into protection mode. (Just in case anyone is wondering, I actually don’t have to wonder – they don’t.) Any idiot can let a dog’s genetics go with the flow but it takes a responsible dog owner to know how to channel that flow and upon occasion brings it to a “grass stains on the pads of the feet – stop and recall”. Don’t get me wrong. I’m not slamming the breed nor responsible Cane Corso owners. I really like the breed and I don’t think you need to have to be public enemy number one or live in a high crime area or be a boar hunter to own one but before you bring a gun with a brain into your life you owe it to yourself, your neighbours, visiting friends and the dog itself to really ask yourself if you have what it takes of the next 10+ years to assume the responsibility that is the reality (or should be) of being a Cane Corso owner. 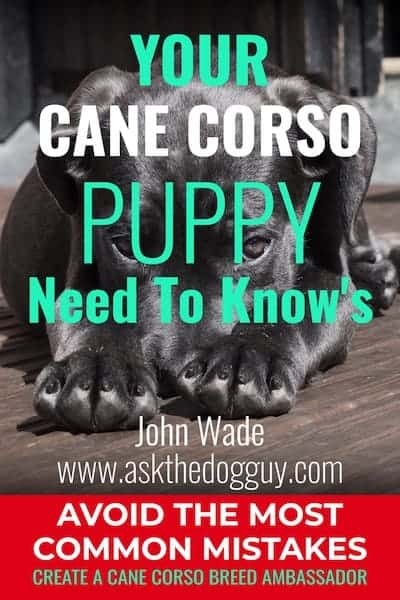 People new to, or inexperienced with the breed often get miffed when I write about the Cane Corso and similar breeds in such a matter of fact way – but frankly, I could care less any more. Sadly the number of people that understand the breed and are willing to make the commitment to obedience etc. are now outnumbered by those thinking it’s not the dog, it’s the owner while ironically not realizing that they are in fact one of “those owners” that dooms a breed to infamy. Far too many of these dogs are being euthanized because of this very sort of Cane Corso dog owner. If the Cane Corso is the right match for you I wouldn’t be worried about the two Dachshunds as long as you’re doing your part. The biggest risk to them is typically accidental injury during play because of the disproportionate sizes. Gender can impact attitude but there are a lot of variables that could mess up any prediction. I’d need to know more about the dogs. I absolutely agree Jeff. Getting one dog is a lot of work. Getting two is three times the work and in my view owning a single Cane Corso and doing it right is at least twice the work in the first place. There isn’t a lot of people left over at the end of the day in this day and age so it’s a worthy consideration. My husband and I have always owned large powerful breeds. In 2007, we got our first Cane Corso and completely fell in love. He was a very lovable couch potato, but would still protect when needed. He was, however, rather low energy. We did take him to basic and intermediate training, which was sufficient for this dog. We also socialized him and his sister, a100 pound German Shepherd, a lot. Sadly, he passed away at the age of five, from cancer and we were devastated. Shortly thereafter, my husband brought home our next Cane Corso, a very large male puppy, who actually looked like a bear…very impressive looking. From the beginning, his demeanor was the complete opposite of our first Corso. Despite the number of previous protection dog breeds that we owned, we were ill-prepared for what was to come. Regardless of the socializing and standard training he received, by the time he was a year old, he became very aggressive and unpredictable. We were in touch with his breeder and after taking our dog to visit him, he offered to take him back and give us another puppy. He once said that he had dogs all over the country but ours is the one he worries about. He is absolutely fearless, high energy and clearly genetically different, but our dogs are our life and we didn’t want to give him up. We traveled to another state for several sessions of intense training and then followed that up with four months of aggression class and a year of additional training which involved attending at least three days per week. We were dedicated and he did turn around. Our neighbors were amazed, but I must say that he is who he is. I still watch his body language at all times when he is around strangers. Although he is completely different than my first Cane Corso, they still have many similar qualities, including complete devotion and wanting to be near us 24-7. I love him with all of my heart, but to say owning him is a job is putting it lightly. There may be Cane Corso owners who do not understand what you are saying because they may not have encountered a dog like this. (I know I hadn’t.) I have absolutely no doubt that my dog could have easily been euthanized if he ended up with the wrong well-intentioned owner. Having said that, to us, the Cane Corso is the most special breed we have encountered and I cannot imagine my life without one in it. We now have two…the boy I described above and a girl, who love each other and us with all their hearts. I have no doubt, they would defend us with their lives. Thank you for the input Wendy. Send a picture and I’ll add it to your comment.